An edited version of this article was published in the Scotsman 12th June 2007. 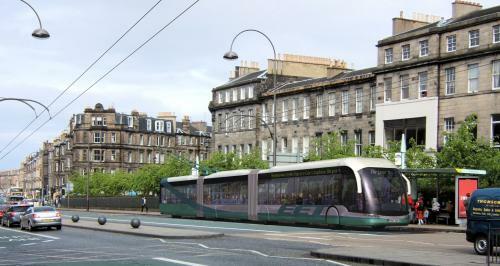 Artist's impression of a modern trolleybus in Edinburgh The "Don't Trash Our Trams" campaign in Edinburgh is right to say that a "reliable, integrated transport system is vital for the economic prosperity of the city". But there is a tried-and-tested alternative to trams that has been neglected so far in the debate: modern trolleybuses. For those too young to remember trolleybuses in Scotland (the last one ran in Glasgow in 1967) or who have not visited cities such as Athens, Rome, Seattle or Vancouver, the trolleybus is a vehicle with rubber tyres that is powered by electricity obtained via "trolley poles" from two overhead wires. In the UK they replaced the first generation of trams because of their greater flexibility and lower maintenance costs, but the short term economics of renewing trolleybus systems during a period of low oil prices convinced UK operators to use diesel buses instead. Just as the modern tram is a different beast from its forebears, so is the modern trolleybus. In the past, trolleybuses had a somewhat exaggerated reputation for "coming off the wires", but modern methods of constructing overhead wires make this very rare nowadays. Using battery power or an alternative fuel source such as diesel or biofuel, modern trolleybuses can also run for short distances without the wires, for example if there are diversions from the wired routes or in the historic centres of cities such as Rome and Beijing. This means they can be as flexible as diesel buses. The latest high capacity trolleybuses are practically "trams on tyres". 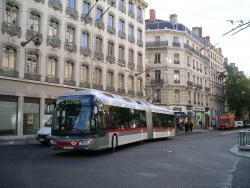 For example those in Geneva can carry 200 passengers - not far shy of the 230 proposed for Edinburgh's trams. Like trams, modern trolleybuses are a green technology, emitting no pollutants at street level. They have a smaller carbon footprint per passenger than buses even if the electricity is generated from fossil fuels, and the footprint will get smaller still as more electricity is generated from renewables. They run so quietly that the Glaswegians mistakenly called them the "Silent Death" because of the perceived likelihood of getting knocked down due to not hearing one. In fact the safety statistics of trolleybuses are every bit as good as for diesel buses due to their powerful brakes and the friction afforded by rubber tyres. Like trams, modern trolleybuses can cause "modal shift", i.e. attract motorists onto public transport. This is partly due to their quietness, smooth ride and lack of vibration. The wires also give a sense of permanence. Modern trolleybuses with low floors and kerb docking mechanisms have the same loading convenience as trams. In San Francisco passenger numbers dropped by up to 15% on trolleybus routes when diesel buses were substituted. On the other hand, passenger numbers increased by up to 18% when bus routes were converted from diesels to trolleybuses. Modern trolleybus in LyonTrolleybuses are a proven technology, used in over 340 cities in the world. New routes are opening and old ones are being refurbished - for example in Zurich, Lyon, Wellington and Salzburg, where the few remaining diesel buses will soon be replaced by trolleybuses. While no trolleybuses run in public service in the UK, they are being seriously considered in Leeds following the withdrawal of funding by the Westminster government for their tram scheme. A key difference between trolleybuses and trams is the cost. Because a trolleybus system doesn't require tracks and the diversion of utilities, the cost of installation could be up to 50% less than for trams. Trolleybus vehicles are less expensive to buy than tramcars. The electric equipment in trolleybuses and trams is inherently longer-lived and cheaper to maintain than the diesel engine and its associated transmissions and its noise and emissions control systems - none of which are needed in electric vehicles. As trolleybuses require no track maintenance, they cost less to maintain than either trams or diesel buses. Like trams, trolleybuses tend to be replaced less frequently than diesel buses, offsetting the initial outlay. If trolleybuses are so good, why were they not considered for Edinburgh? It is possible that trolleybuses were not considered "good enough" for a capital city, as hinted at by the pro-tram argument that Edinburgh is the only capital in western Europe without a tram system apart from Luxembourg, Cyprus and Malta. Edinburgh is, however, smaller than most other western European capitals. In the Parliamentary scrutiny, the tram promoters only mentioned trolleybuses in passing and they were not considered as an option in the cost-benefit analysis of the Edinburgh tram scheme. Other alternatives have been mentioned in the debate, in particular hybrid buses which use a combination of a diesel powered generator, a large battery, and powerful traction motors. Unfortunately the technology is still relatively new and although hybrids are more fuel-efficient than normal buses, they still pollute the streets. At best, hybrids are the transport equivalent of the low-tar cigarette. Hydrogen powered vehicles are currently impracticable because of their low efficiency and high weight. A key argument against dropping the tram scheme is the amount of money that would be wasted by doing so. However trams and trolleybuses use similar infrastructure (substations, overhead cables and depots), so if the tram scheme fails, a lot of the work done by TIE could be equally applicable to a system of "trams on tyres". Because of pressure from cities such as Leeds, the UK Road Vehicle regulations should soon be in line with the rest of the EU, permitting the double-articulated vehicles long enough to carry 200 passengers. Even with no regulatory changes, 130 passengers could still be carried - significantly more than a double-decker bus. For the sake of the environment, human health and economic development it is important that we create an electric transit network in Edinburgh. I was a firm supporter of trams when Edinburgh was to have three lines, but I agree with Friday's Scotsman editorial that "the tram project is questionable if it stops at only one line". I believe it's time to consider how we can make Edinburgh's transport network as green as possible with the money available. Because of the affordable nature of trolleybus infrastructure, it might in the long term be possible to electrify many of Edinburgh's bus routes. And why stop in Edinburgh? If the Dutch city of Arnhem (population 142,636) can have a trolleybus network, why not Dundee (population 143,090)?